Last week, I participated in an event at Pilot Coffee Roasters in Toronto and spoke a little bit about my experience with social media, and how cafes can use storytelling to help drive business. Since social media is such a big topic, I thought it might be helpful to follow up that discussion by distilling a few of the ideas I have about how cafes can best utilize social media—particularly Instagram—as a tool to help extend the culture of their cafe beyond the confines of a brick and mortar. A huge thank you to Pilot Coffee for asking me to share at their inaugural Coffee Forum event for their wholesale partners—it was such a treat to engage with their coffee family. 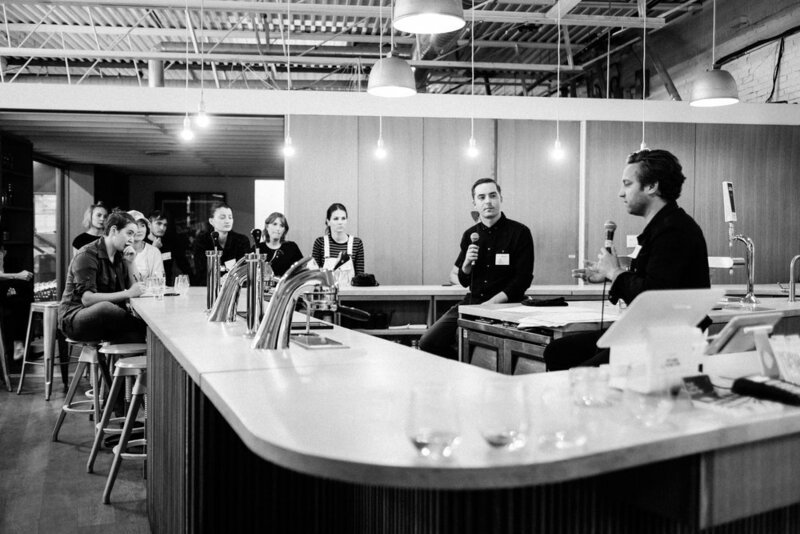 Pilot co-owner Rob Wilkin hosted the panel-like event which also featured speakers; Chalo Fernandez a 5th generation specialty coffee producer from Colombia, Alan Bekerman the founder and CEO of IQ Food Co., and Eric Mahovlich the lead barista at Pilot's Roastery & Tasting Bar (all pictured below). Before we kick off, some of you may not know that this site was built out of the desire to open my own coffee shop. I started The little Black Coffee Cup only a few days before I began coffee business training at the American Barista & Coffee School in Portland. The idea behind the tLBCC media launch was to begin building a brand long before the doors to my future shop were open by sharing the things I was learning about coffee along the way (If you are in the process of building a shop, launching media long before you are open is something I’d also recommend you consider). As it turned out, I became so captivated by all the stories surrounding coffee that my desire to open a coffee shop became secondary to my interest in telling them. Today, when people ask me what I do, I say, “coffee media.” Since this isn’t a recognized profession, I will follow that up here by saying: I spend a lot of time communicating ideas and stories about coffee—my own and others—and contemplating what words resonate, what photos matter, and what stories are important. Naturally, I’ve made lots of mistakes over the years and also had some successes along the way. Social media is an integral part of how I do what I do. I also use instagram as a tool to determine what shops are worth visiting when I am traveling—and I travel often for coffee. This means I pay attention to what works for other folks and businesses engaged in the coffee media space. My hope is that some of the following thoughts and ideas will be useful to you as you navigate the often daunting world of Instagram. 1. Give us your coffee shop's current details. Although all of the above suggestions sound very simple, these are critical bits of information to include on your Instagram profile and must not be taken for granted. Providing a complete and up-to-date profile page is the first and most important step in a coffee shop's success on Instagram. It is essential to give your cafe customers (or potential customers) all the basic information they need to know about who your business is, what it is, and how they can find it as easily as possible. Starting with clear visual cues (see: fig. 1 use a high res logo or photo clearly associated with your brand), and following up with very clear messaging, will remove all the guesswork for people visiting your page and will, in turn, make visiting your shop a no brainer. In my experience, it's frustrating to come across a coffee shop's Instagram profile that displays an unclear photo coupled with incomplete and outdated information. If I have to do detective work to figure out where a shop is and what they are about, the interaction costs me extra effort and time that I don't always care to give. Furthermore, if I am uncertain that the Instagram page I am looking at is the correct one, I will be less likely to tag this shop in anything I may be posting—this translates into a missed marketing opportunity. On the flip side, including the essential information on your cafe's profile page will actually save you time and effort. A well detailed profile means free media by way of more tags and sharing from your current customers. It also means less messages hitting your inbox from confused social media users or perplexed potential customers. Being clear with your cafe's basics on social media is a win-win for everyone. 2. Identify your coffee shop's voice. The above questions are designed to help you get a better sense of who your coffee shop is, how it speaks, and what it speaks about. That's right, your business has a personality, and Instagram is a really great platform for that personality to express itself. Whatever compelled you to open your coffee shop in the first place—the need you were filling, what you aimed to provide to the neighborhood, who your target customers are, what influenced your design, and the emotion behind all of that—is likely where your cafe's social media voice is waiting to be discovered. Take some time to reflect on it. Jot down a few notes, and come up with a phrase or sentence that sums up your social media point of view. For example, if you opened a 80's inspired, toddler-friendly cafe space with neon signage, the corresponding voice could be: a millenial mom obsessed with the 80's. How about a tiny, minimalist space serving up vegan cinnamon buns, oat milk only, and direct-trade coffee from a roaster out of Sweden? Perhaps a phrase that could help define this shop's voice would be: only the essentials. For the Toronto Coffee Community Instagram I refer to two; a supportive friend, and a rising tide lifts all ships. As you can see, all of these examples come with a specific perspective. Some of them speak a pre-determined language and also suggest a particular aesthetic. A defined point of view makes choosing an image and writing a caption much easier. It's also the perfect jumping off point to connect and start a conversation with your customers online. If you've spent some time brainstorming and still aren't able to determine how your shop speaks, another way to find it's voice is by posting. Over time and many photos and captions later, your shop's voice will likely emerge. Either way, keep in mind that your shop's social media voice is not static. It will be evolving with you and your business as it grows. 3. Extend your coffee shop's hospitality online. When a customer comes into your shop I am assuming you are aiming to give them an exceptional coffee experience. Their interaction with your cafe's social media can also be exceptional—in its own way—and the space you are creating online has the benefit of being accessible 24 hours a day. It's time to reframe the common question, "How can I use social media as a tool to get more people to [insert request here]," into a question with an outcome that is directly in your control: "How can I use social media as a tool to give more to my potential customers." An Instagram account can be an extension of your coffee shop's hospitality. What can you do to add value to your customers online? Whether it's through a funny caption, a meaningful quote, a beautiful photo, a hilarious video, a share about a barista on your team, or something interesting you learned recently, if you are generous with your customers online, chances are they'll keep liking your material and will also keep their eyes on your page. They might even be compelled to show their friends your profile and talk about your shop. Word of mouth is powerful vehicle to get people through your doors. When it comes to social media, in my experience, it is to our benefit to be generous. The exchange isn't a one to one (eg. coffee for cash), but the larger culture and hospitality you are extending beyond the walls of your cafe can translate into currency, too. Ways to add value via your Instagram account are very business specific and directly relate to identifying your shop's voice. One post can't possibly add value to all of your customers in the same way, however if you keep the idea of giving us something in mind before clicking share, I'm confident you're already on the right track. 4. Find the stories surrounding your coffee shop & share them as they unfold. STORIES ARE EVERYWHERE. In fact, every decision you've ever made about your business is a potential story to tell. From who your wholesale partners are to why you only serve batch brew, to where you sourced your ceramics from, to the event happening in your space, or that new piece of equipment you purchased—you get the idea! Since you are continually making decisions about your business, it is also true that the stories surrounding your shop are constantly unfolding. Of course, some choices you've made aren't as meaningful as others, but it is to your benefit to use Instagram as a tool to communicate the significant ones with your customers as they happen. Products, stuff, and gear aside, the richest stories to come out of your shop are human focused; highlighting your baristas, your customers, your partners, and your community. Sharing human stories can add value to the people you are sharing about and to your business. In the specialty coffee industry, many shop owners often ask the question, "How can I educate my customers about specialty coffee?" Another way we can frame this question is, "How can I pass along stories I care about to my cafe guests?" Unfortunately, a 'customer training' approach to service usually ends up alienating a very large and important segment of the coffee drinking population—people who came in for a simple cup of coffee or a break in their day (read more of my thoughts about this here). Since baristas only get a few moments to interact with guests IRL, the hospitality in a cafe is better directed toward listening than toward storytelling. Social media (instagram, facebook and/ your shop's own blog or website) is the perfect place for you to communicate everything you'd like your customers to know about your business and the coffee you are serving. Now that you've identified your voice, decided you want to give us something, and tapped into some stories worth sharing, you have a free platform to engage with us. It will cost you some time, but please use it! 5. Be responsible and thoughtful about what you post. Whether you have one follower or one million followers, if you are engaging on social media, you are an influencer. What you choose to post and sometimes what you choose not to post are contributions toward the current coffee culture, your community, and (dare I say!) the world at large. As Spiderman (...or was it Voltaire, or Uncle Ben?) said, "With great power comes great responsibility." Not every post has to be imbued with profound meaning, just take a moment to be mindful and considerate before you press the share button. Although I already posed this question in the image above, it bears repeating again: Overall, are the photos in my feed reflective of the diversity of my cafe guests and employees? As the specialty coffee industry (and beyond) is faced with significant issues regarding diversity and inclusion, it is crucial that all people that participate in our industry are represented in our media fairly and equally. One more thing: Everyone is going to make mistakes on social media. It's how we handle those mistakes that matters. 6. Being consistent is better than being perfect. If your posts keep showing up in our feeds with the goal of adding value, it's very likely that your coffee shop will be unforgettable. For more on coffee marketing & social media, check out Jenn Chen's website. For more on marketing & doing work that matters, check out Seth Godin. Buffer is a great tool for scheduling posts & managing social media across platforms. A few more photos from Pilot Coffee Roasters' Coffee Forum Event below.